The Studio La Arena is located on the west coast of Tenerife, very close to Playa de la Arena beach. A rental car is not necessary. Shops of all kinds, bars, restaurants and the beach are within walking distance. The apartment is very high quality and tastefully decorated. The modern furniture and appliances leave nothing to be desired. The studio has about 40m ² divided into a bathroom, kitchens and living area. The spacious balcony is covered. From the balcony you can enjoy the view of the Atlantic Ocean. Guests have access to a shared swimming pool with a large sun terrace and sun loungers. The kitchen is equipped with toaster, kettle, dishwasher, fridge, ceramic hob and essential cooking utensils. In the living area there is a comfortable and large sofa, TV with German and Spanish TV programs. The bathroom has a shower cabin and washing machine. Towels and bed linen are provided. There is also a vacuum cleaner, iron and ironing board. Internet connection via W-Lan is available. Out of consideration for non-smoking guests, smoking indoors is not allowed. Prices: The daily rent is 48 euros. The final cleaning costs a daily rent. 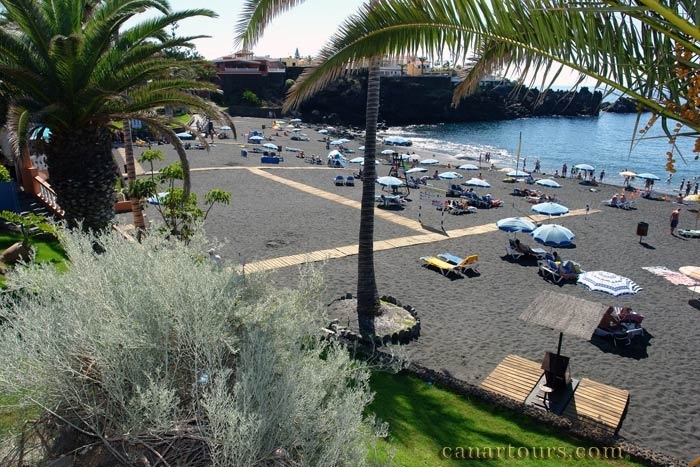 Playa de la Arena is part of the town of Puerto de Santiago and in the west of Tenerife. It is one of the most beautiful black sand beaches of the island. One can find a beautifully planted directly on the promenade along the sea offers many bars, restaurants and shops of all kinds. Puerto de Santiago offers 360 days of sunshine a year with an average temperature of 25 C to 28 C. There are many small restaurants with good food waiting for you. You can go from here long walks or boat trips, while, with luck, will be accompanied by dolphins. And for fish lovers there are opportunities for deep sea fishing. Nevertheless, Puerto de Santiago, a resort in which there is still approaching quiet, for the tourists swarm is not too large and the possibilities to spend a relaxing holiday are given all around. Along the coast west to get to Puerto de Santiago, which is due to the cliffs of Los Gigantes known in the area. The city has a large bay and a yacht basin and grows quickly into a resort. All kinds of shops 200m – 300.